Kidology's Ultimate Toolbox for Children's Ministry has everything you need to run a children's ministry that transforms the lives of children, encourages and empowers volunteers, and gives each leader the vital help they need. This all-inclusive handbook by renowned kidologist Karl Bastian is chock-full of handouts, downloadable forms, PDFs, and step-by-step guides. It covers all the key areas of ministry you need with personal tools, leader tools, teaching and training volunteer tools, and outreach tools. This book will offer additional videos, downloads, and resources that complement the materials in the book from the Kidology website and the included CD-ROM! This is your one-stop musthave toolbox. 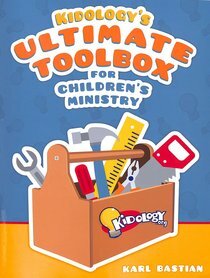 About "Kidology's Ultimate Toolbox For Children's Ministry"